See the Promised Land through the eyes of the Patriarchs, Matriarchs, Tzadikim, Kaballists and Zionist forefathers. Explore your birthright in your own land with your own private tour guide on your own custom tailored luxury themed Jewish Tours of Israel. Stop and reflect at Judaism’s holiest site. It is said, according to Jewish legend, that when the Temple of God was destroyed the Holy Spirit descended upon this retaining wall to the platform of the Temple. Judaism’s great legacy to the world is spiritual, but the massive stones of the Wall, each with its perfectly carved border, are testimony to the physical grandeur of the ancient Jewish world. Over the centuries, this enduring fragment of the Temple complex has come to symbolize the indestructible attachment of the Jewish people to the land of Israel. For more than 1,000 years, under Islamic governments, the Wall was the closest point that Jews were permitted to approach to the place where the ancient Temple of Jerusalem once stood. Because of the sanctity of the Temple Mount itself, very observant Jews do not go farther than the Wall to this day. The kotel became a place of mourning over the destruction of the Temple and Israel’s exile and it became known in European languages as the “Wailing Wall”. Herod’s hilltop fortress where Jews held out against the Romans in the year 73 CE ending the Great Revolt. Ascend up to the mountain – by foot/ by cable car – on the winding “Snake Path” and enter the hilltop fortress though the casemate wall. 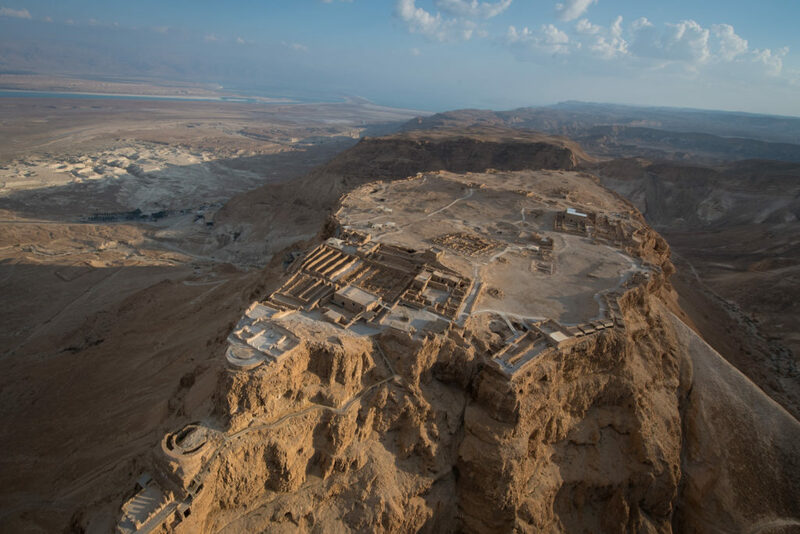 The remains of the fortress of Masada are well-preserved and have been reconstructed in some parts. The most impressive structure on Masada is King Herod’s northern palace, built on three rock terraces overlooking the gorge below. Near the palace is a large Roman style bath house with a colorful mosaic floor and walls decorated with murals. Many other buildings at the site – such as the luxurious western palace, the mikveh (Jewish ritual bath), storerooms, watchtowers, and a synagogue relate the history of Masada. This medieval mountaintop village set amid a pine forest – at an elevation of 2,953 feet – is the birthplace of Kabbalah (Jewish mysticism). Today it’s a community of artists, mystics, and Hassidim. Safed – one of the four holy cities together with Jerusalem, Hebron, and Tiberias – may play an important role in the final redemption. It’s said that the Messiah will come from Safed on his way to Jerusalem. Wander among the galleries and ancient synagogues that dot the alleyways of this quaint, spiritual village.